The buses are coming out of the transit tunnel. Here’s what it means for transit riders and drivers. 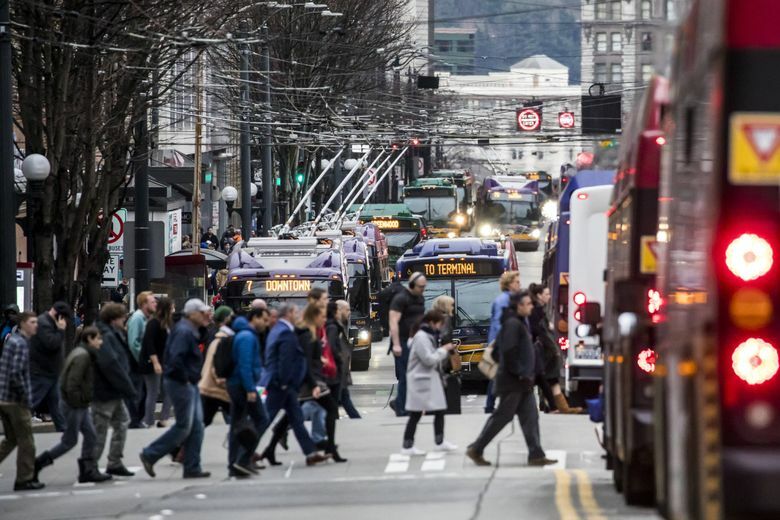 Wait for a bus at the corner of Third Avenue and Pike or Pine streets during the evening rush hour and you’ll be one of nearly 5,000 people doing so between 3 and 7 p.m. Meanwhile underground, 6,000 more bus riders catch a ride at Westlake Station in the same period. Starting Saturday, those buses under your feet — and their thousands of passengers — will move above ground, joining surface traffic and testing the patience of bus riders and drivers alike. More than 800 bus trips each weekday will move from the tunnel to surface streets. Light-rail riders could see more reliable trips through downtown as the tunnel serves only trains. It’s the latest stage of the “Seattle Squeeze.” If you catch a bus or drive downtown, you’re likely to notice the change. Here are answers to your questions about how to navigate it. How many bus riders use the tunnel? How much longer is it going to take to get through downtown on a bus? What are the city and King County Metro doing to prepare? Will more all-door boarding bring more fare enforcement? Which areas will see the biggest impacts? Will there be new bus shelters, now that more riders will be waiting outside instead of in the tunnel? Will Google and other apps reflect the route changes? Will light-rail trains operate more frequently? Will they rename the tunnel stops? And what are we supposed to call the bus tunnel now? How will the new bus lanes on Fifth and Sixth avenues work? Will police increase enforcement of the bus lanes? How much will all these changes cost? What should I do if I have a question about the changes? How much will all these changes cost? Q. How long will this last? A. Forever. Buses are coming out of the tunnel permanently. King County Metro makes regular changes to bus service, and bus moves are still to come on Seattle’s waterfront. More change will arrive in a few years, when new light-rail stops open and trains can move people more quickly than buses. That could mean some surface bus routes get replaced by light rail, though final decisions haven’t been made. For now, this is the new normal. A. Local politicians and transportation leaders cite two flash points of Seattle’s growth: the expansion of the downtown convention center and new light-rail extensions that will open in coming years. Today, buses access the tunnel below Ninth Avenue between Pine Street and Olive Way, where Convention Place Station previously operated. Soon, that entrance will be blocked by construction of the 1.5 million-square-foot convention-center addition. The Metropolitan King County Council voted in 2017 to sell the Convention Place Station. King County Metro will receive $275 million, including interest, over 32 years, which will go toward operations and capital projects. Sound Transit says it also needs buses out of the tunnel to do work necessary to prepare for new light-rail lines, primarily the route to the Eastside, which is set to open in 2023. Q. Is my bus route affected? A. If you rely on any bus through downtown — even one that doesn’t go through the tunnel — be sure to check to see if your stop has changed. Seven routes that currently use the tunnel will shift to surface streets. Eight others already on surface streets will be shifted to different streets. That means your usual downtown bus stop may be moving. Here are the routes that currently use the tunnel: Metro routes 41, 74, 101, 102, 150 and 255, plus Sound Transit Route 550. Riders will no longer be able to catch any of these buses in the tunnel and instead will find stops on surface streets throughout downtown. The new stops will be along Second, Third, Fourth, Fifth and Sixth avenues. The following Metro routes already run on surface streets downtown but will be shifted in an effort to make room for all the buses: 76, 77, 252, 257, 301, 308, 311, 316. Use this page to find your route and the exact changes to stop locations. Metro and Sound Transit staff will also be out at bus stops and in the tunnel during the first days of the change to help answer questions. Passengers whose stops are moving to Fifth or Sixth avenues are sure to notice having to walk a few extra few blocks uphill. For people with mobility challenges, Metro recommends consulting this map or calling its customer-service line at 206-553-3000 for help finding a path to a new stop. Q. What should drivers expect? A. It’s not going to get any easier to drive downtown at already-congested rush hours. Switch your trip time or avoid driving if you can. Look out for new driving and parking restrictions on Fifth and Sixth avenues. Q. How many bus riders use the tunnel anyway? A. Just seven bus routes travel through the tunnel, but they deliver thousands of people into and out of downtown. During the busiest hours, from 3 to 7 p.m., the bus routes that travel through the tunnel see about 10,400 boardings. Q. How much longer is it going to take to get through downtown on a bus? A. If you use a bus route that currently travels through the tunnel, expect a bit of extra travel time. Bus routes currently using the tunnel will take up to 13 minutes longer to get all the way through downtown at the busiest time of day, according to King County Metro. Just how much extra time you’ll spend on the bus will depend on when you’re traveling and how far you’re going through downtown. 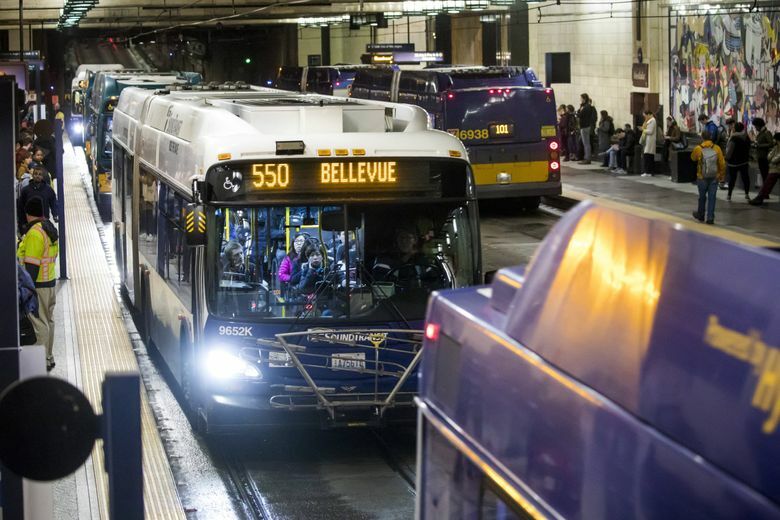 Sound Transit predicts that its Route 550, which serves Mercer Island and Bellevue, will take about seven minutes longer than usual during peak times. If you use a downtown route that doesn’t currently use the tunnel, your travel time shouldn’t change much, Metro predicts. The agency and City of Seattle are urging riders to use ORCA passes to speed up boarding, shift travel times if possible or bike or walk. Q. Will bus schedules change? A. Moving buses out of the tunnel won’t reduce any routes. But some other routes will get new, increased service at the same time. These busy routes will get varying degrees of additional service: 15, 40, 41, 50, 102, 106, 120, 111, 204, 312. Use this page to find exact details about the improvements. Q. What are the city and King County Metro doing to prepare? A. To help buses move along the already busy Third Avenue, King County Metro is launching all-door boarding for all 42 bus routes that use the street. This means you’ll be able to tap your ORCA pass on a sidewalk reader and board the bus through any of its doors. Paying with cash at the front door will still be allowed. But the more people who tap their cards on the sidewalk, the faster buses can pick up passengers and get moving. Metro says the change could reduce the amount of time buses wait at stops by 20 percent. Still, the agency hasn’t finished installing the necessary equipment for the change. Along the corridor, 21 stops have ORCA readers installed on the sidewalk but an additional 10 don’t. Those stops will have Metro employees standing with handheld ORCA readers between 3:30 and 6:30 p.m. until kiosks are installed by next year. 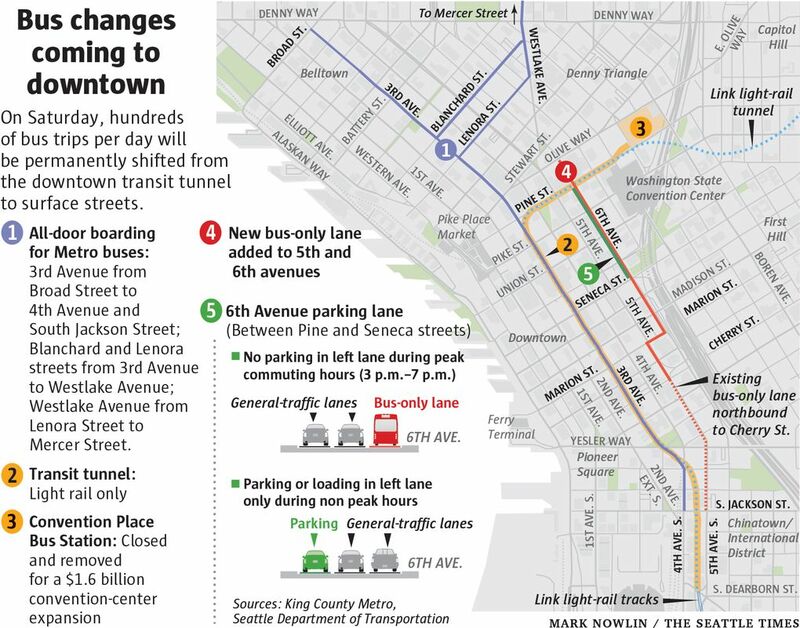 The city has also created a new bus lane on Fifth and Sixth avenues to help buses headed from downtown to Interstate 5 (more on this below). Q. Will more all-door boarding bring more fare enforcement? A. Yes. King County Metro says it will spend $1.3 million a year on 15 new fare-enforcement officers, a supervisor and an assistant. Metro currently uses fare-enforcement officers on Rapid Ride buses, which can be boarded through all doors. The agency has in the past faced scrutiny for the way its fare enforcement disproportionately affects people experiencing homelessness. Last year, the county changed its enforcement policies to reduce the cost of a fare-evasion ticket and move the process from the courts to an administrative system. Q. Which areas will see the biggest impacts? A. You’ll notice more people waiting for buses all over downtown, especially during the evening commute from 3 to 7 p.m.
With Third Avenue already the busiest bus corridor, most of the tunnel routes won’t be redirected there, but the street will still see heavy bus and pedestrian traffic. New stops at Fifth Avenue and Marion Street and Sixth Avenue and Union Street will be busy, too, with about 500 riders expected to board buses during the busiest hour, from 4:30 to 5:30 p.m. 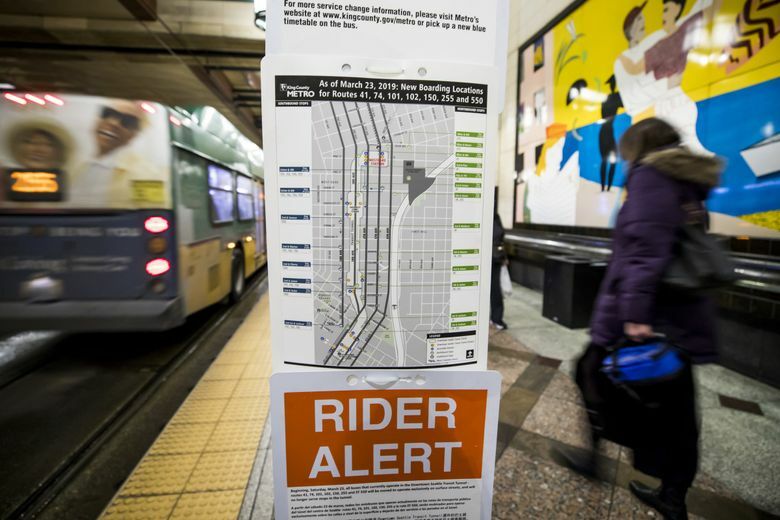 Stops at Sixth Avenue and Olive Way, Sixth Avenue and Union Street, Second Avenue and Yesler Way and Fourth Avenue and Jackson Street will see increases, Metro predicts. Q. Will there be new bus shelters, now that more riders will be waiting outside instead of in the tunnel? A. A new stop at Fifth Avenue and Marion Street will have two new shelters side by side. Elsewhere along Fifth and Sixth, Metro suggests riders use nearby building canopies to get out of the elements. Q. Will Google and other apps reflect the route changes? A. Transportation officials have shared updated information with apps like Google and One Bus Away. It will be up to those companies to update their apps, but the city will be repeatedly reminding them about the changes, said Seattle Department of Transportation (SDOT) spokesman Ethan Bergerson. You can also text your stop ID (find it on the sign at the bus stop) to 62550 to find out when the next bus is coming. Q. Will light-rail trains operate more frequently? A. No. If you ride light rail through the downtown tunnel, you won’t see any immediate changes to stops or schedules, but your train may get more predictable. 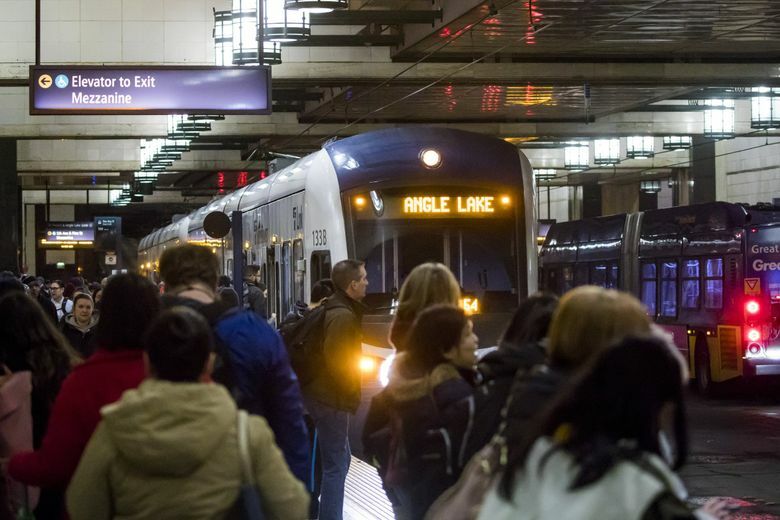 Sound Transit says removing buses from the tunnel will allow trains to stick more closely to their current schedules, which say trains should show up every six to 12 minutes, depending on the time of day. Eventually, when more routes are open, trains will come more frequently. By 2023, they’ll arrive every four minutes, Sound Transit says. Q. Will they rename the tunnel stops? And what are we supposed to call the bus tunnel now? A. Sound Transit will update signs to remove references to bus routes in the tunnel. But the agency won’t say yet whether it will rename any stops or the tunnel. For now, it’s still the Downtown Seattle Transit Tunnel. Sound Transit will likely take ownership of the tunnel from King County Metro early next year. Q. How will the new bus lanes on Fifth and Sixth avenues work? A. SDOT says a new bus-only lane on Fifth and Sixth avenues will improve bus reliability through downtown during the evening rush hour, particularly for buses needing to get onto Interstate 5. But the lanes will take some getting used to for drivers. A bus-only lane already exists on Fifth south of Cherry Street. That lane is restricted at all hours and buses run against the flow of traffic until they dip under Seattle Municipal Tower and into the express lanes on Interstate 5. SDOT will extend that lane northward for two more blocks along Fifth. Buses will then turn right on Marion Street and then onto a new bus lane that goes with the flow of traffic on Sixth Avenue to Olive Way. There, things get more confusing. On Sixth between Seneca and Pine, lanes will switch purposes depending on the time of day. From 3 to 7 p.m. on weekdays, the right lane will be restricted to buses only. Two other lanes will be for all traffic during those hours. Outside of those peak hours, the right two lanes will be for all traffic and the left lane will allow parking and loading. In short: The exact situation changes from block to block and based on the hour. Keep an eye out until you get used to the new configuration. Q. Will police increase enforcement of the bus lanes? A. Seattle Police will have officers assigned to the new bus lanes, though the department wouldn’t offer specifics about where or how many officers will be out. Tickets for bus-lane violations are $136. Q. How much will all these changes cost? A. 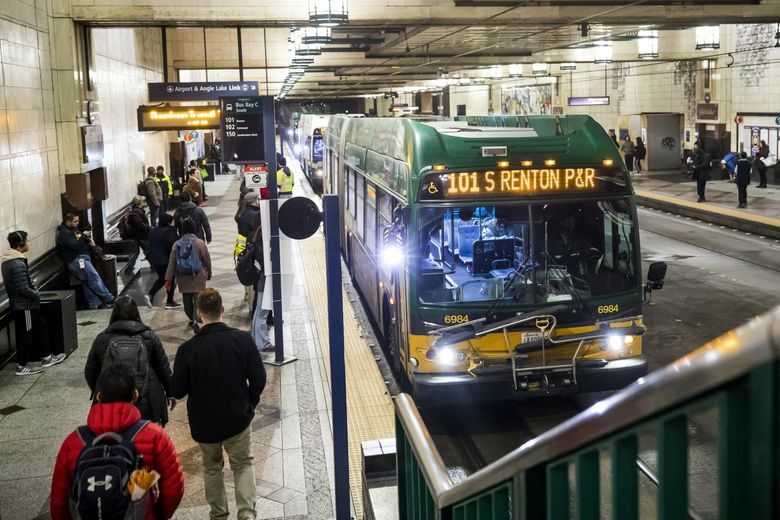 The city, Sound Transit and King County Metro are together spending $30 million for transit and pedestrian improvements. New bus service is funded through a tax measure approved by Seattle voters in 2014. Q. What should I do if I have a question about the changes? A. Call Metro’s community-service line at 206-553-3000 for help. Reach Sound Transit at 1-866-940-4387 or servicechanges@soundtransit.org.